Don’t worry about trying to pronounce Nyki Nechiporenko’s “very Russian” married surname. Seriously. Let’s just move on and get to the good stuff – her fabulous career. 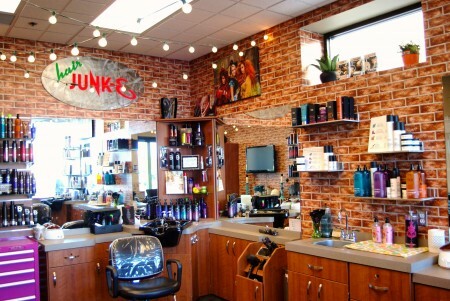 When it comes to hair, Nyki, owner of Hair Junk-E at Sola Salons Roseville, MN has always been a natural. “My parents knew I was going to do hair when I was three,” says Nyki. Sure, she considered other careers; but two months out of high school Nyki was enrolled in cosmetology school where she specialized in color — a great specialty in a locale where clients are constantly change their dye with the changing seasons. After graduating, Nyki cut her teeth at Fantastic Sam’s – that gig only lasted two months! – and the now defunct Hair Color Experts, where the stylist finished out her first year in the industry. For the next seven years, Nyki worked at a commission salon, which wasn’t all-bad. “I had a lot of opportunity there to do extra training,” Nyki recalls. Education’s key to keeping up in a fast-paced industry, and Nyki has always taken hers seriously. In fact, since completing her formal education in 2005, Nyki’s taken “countless advanced training classes, including a four-day color course at the Wella Studio Los Angeles,” she says. Nyki’s previous digs were fine, but in the back of her mind the stylist knew she wanted to open her own salon — she even had the name picked out: Hair Junk-E, a collaborative effort between Nyki and a friend whose military husband was relocated to Colorado before the duo realized their pipe dream might actually be possible. For Nyki, the biggest barrier to salon ownership had always been bookkeeping. “I color hair, I don’t crunch numbers,” she says. “Since I had never booth rented, I never had to keep track of my own numbers,” Nyki continues. “Keeping track of sales and retail; making sure taxes were done correctly — those were the things I was most nervous about,” she admits. Nyki’s fears were alleviated two years ago when she met Erin Elgin, an accountant and co-manager of Sola Salon Studios Roseville who happily helps Nyki with all of her number crunching! When Nyki first read about Sola Salons, she thought the letter she’d received was spam. “It seemed too good to be true,” Nyki recalls. But, Nyki toured the studio anyway. “Right then, I was like, ‘DONE,’” says Nyki. “The reality,” she continues, “is that Sola is the best of both worlds; it’s a dream come true.” Nyki signed her lease on the spot, and opened Hair Junk-E that spring. After all, as Nyki puts it, “Life’s too short to work in an environment where you aren’t 100 percent happy.” Nyki’s salon – a double shared with a friend – has a modern eclectic feel with its big, light-flooded front window, clean lines, natural cabinets, faux brick wall, hanging lights and a monstrous avant-garde print courtesy of Nyki’s Colorado-based friend and inspiration. “A lot of clients have said they feel more comfortable here than at a big, crazy salon,” Nyki says. Maybe that explains all of the growth she’s seen — a 35 to 40 percent increase in clientele in two years, Nyki estimates. “At my last place I definitely had a good clientele,” Nyki clarifies, “But,” she adds, “it’s crazy how many more people I get at Sola when they’re booking directly through me and not a third party.” “You’re at home just as much as you are at work nowadays,” Nyki adds. “You might as well be happy and comfortable.” We couldn’t agree more.